Long-term collaborations spanning a range of research and education efforts, engineering projects, workforce development and philanthropic activities are among goals set forth in an agreement between Aerojet Rocketdyne, a subsidiary of GenCorp, and Arizona State University to take effect July 1. The agreement seeks to establish working relationships partnering Aerojet Rocketdyne with faculty and students of ASU’s Ira A. Fulton Schools of Engineering. California-based GenCorp is a major technology-based manufacturer of aerospace and defense systems and products. Aerojet Rocketdyne is an aerospace industry leader in technologies to support strategic missile and armament defense systems and space exploration. The Ira A. Fulton Schools of Engineering has an enrollment of about 9,000 students and more than 230 faculty members teaching and pursuing research across a full spectrum of engineering disciplines. Under the agreement, the engineering schools will provide continuing education and professional development opportunities for Aerojet Rocketdyne employees. Some of the training may be provided through the Supply Chain Management program, a collaboration of ASU’s engineering schools and W. P. Carey School of Business. The agreement also provides for ASU to serve as a source for new employees and student interns for the company, and to provide access to research by faculty and graduate students in Aerojet Rocketdyne’s areas of interest. The two parties are to team in efforts to develop proposals for funding of research projects and to share information through active membership on advisory boards of various university and company programs. Aerojet Rocketdyne will also collaborate with the Fulton Schools’ Engineering Career Center to support students. The company will participate in the center’s career fairs, and develop and implement an Aerojet Rocketdyne Student Co-op Program. It will also sponsor student scholarships and fellowships. Company employees will serve as advisers and judges for senior engineering students’ capstone design projects and mentor students involved in ASU’s Engineering Projects In Community Service (EPICS) program. Aerojet Rocketdyne will sponsor the student Daedalus Aeronautics rocketry club and participate in online and video classes and advanced degree programs. The agreement details plans for collaborative industry research projects. ASU engineering faculty members and Aerojet Rocketdyne employees will team on research in computer software and electronics, combustion and computational fluid dynamics, control systems and analysis, and materials engineering. More research projects may be developed. “ASU is an incredibly innovative university and our new partnership has the potential to redefine corporate-university collaboration,” said Aerojet Rocketdyne president Warren M. Boley, Jr. The relationship will extend beyond ASU’s engineering schools to include at least one joint engineering/business program in the W. P. Carey School of Business. “ASU’s Supply Chain Management program is ranked number three in the country, and we will continue to utilize both the school of business and the engineering schools to provide our employees specialized training in operational excellence,” said Aerojet Rocketdyne’s vice president of supply chain materiel management Hal Martin, who was instrumental in forging the new ASU-Aerojet Rocketdyne partnership. 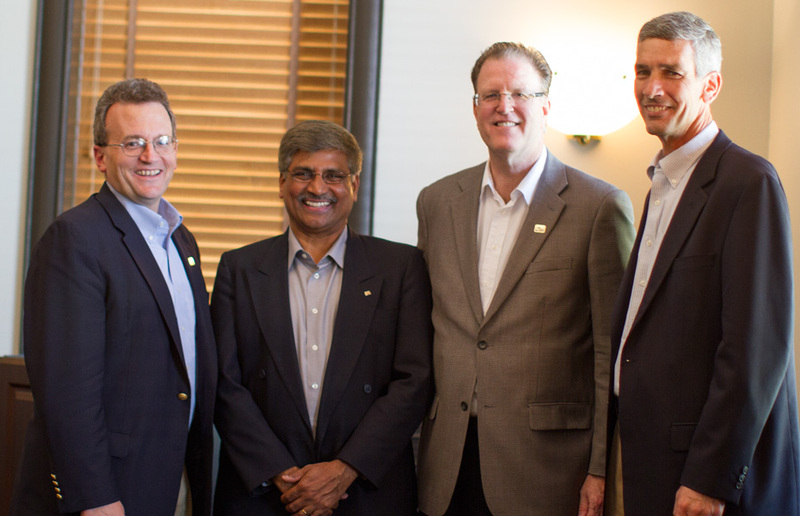 Martin helped ASU develop its current supply chain management curriculum in 2001. 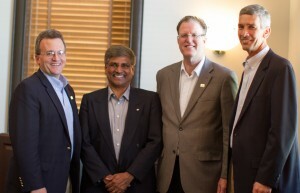 ASU and Aerojet Rocketdyne signed the partnership agreement on June 27 at the university’s Tempe campus.